The Southern Berwyn Hills; Craig Moelfre, Craig Orllwyn Rocks and the Tanat Valley. Photo 30 (above). Along the southern flanks of the Berwyn Dome structure most of the rock units begin to show a general dip towards the south, down towards the Tanat Valley, which forms the southern boundary of the Berwyn Mountains. The hills on the left hand skyline lie along the crest of the Berwyn Dome structure, but the rocks in the hill in the right distance (Gyrn Moelfre) and in the foreground hills (Craig Orllwyn rocks) begin to dip predominantly south, although in detail their structure is more complex, with several smaller west-east fold structures also present. Photos 31 & 32 (left/right) above. 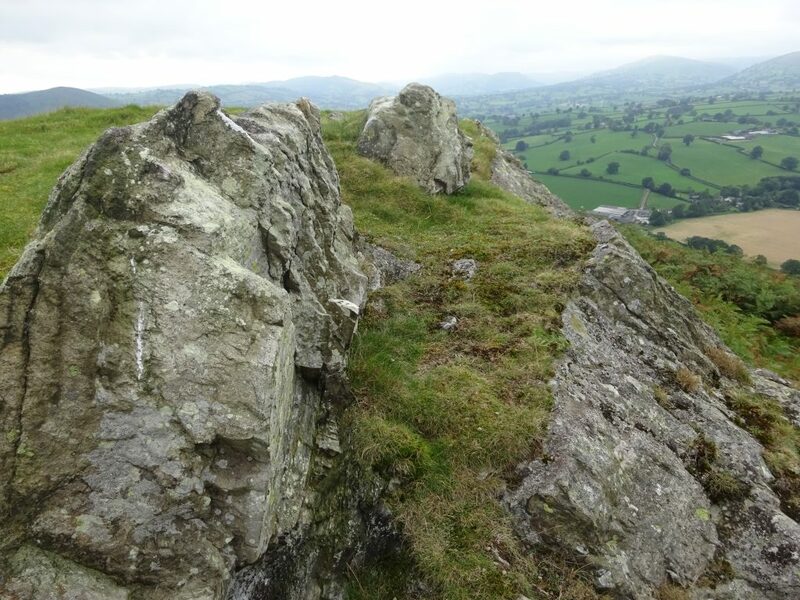 The Cwm Clwyd Tuffs, which form Craig Orllwyn rocks, on the southern margins of the Berwyn Mountains clearly dip steeply to the south in these photographs. In the distance, their southern slopes dip down into the long west-east trench of the Tanat Valley. This valley is underlain by a long, straight fault, the Tanat Fault, which forms the southern structural boundary of the uplifted Berwyn Dome.